In an attempt to divert attention from International Nestlé-Free Week (29 October - 4 November 2012), Nestlé - one of the most boycotted companies on the planet over its baby milk marketing - has announced that its two-finger KitKat chocolate bars will bear the Fairtrade logo from January 2013. International Nestlé-Free Week is a time for people who boycott Nestlé over the way it pushes baby milk to do more to promote the boycott - and for those who don't boycott to give it a go. Nestlé has also spent the past year setting up a special centre to monitor comments about it online so its agents can step in when it is criticised. The announcement, made simultaneously by Nestlé (UK) and the UK Fairtrade Foundation on 26 October comes as thousands of boycott supporters have emailed Nestlé executives calling on them to respect international minimum standards for the marketing of baby milks and thousands have signed a petition of solidarity with the Philippines, where Nestlé is attempting to weaken regulations introduced to protect parents and health workers from misleading marketing. Baby Milk Action has produced a leaflet explaining "Why boycott Nestlé Fairtrade KitKat" with key facts on the baby milk issue, as well as concerns about Nestlé's sourcing of cocoa and other business practices. Halloween falls during the week and people are invited to put "Nestlé-Free Zone" posters in their windows to show they will not be handing out Nestlé sweets. Baby Milk Action is also promoting a fun iPhone app for "detecting" Nestlé products (click here for the secret of the app) and an updated credit-card sized list of Nestlé's main brands. "The timing of Nestlé's announcement of these Fairtrade KitKats becoming available next year smacks of desperation on Nestlé's part. Let us hope it backfires with journalists giving publicity to the week, which helps increase pressure on Nestlé over its unethical marketing of baby milks. At the current time our partners in the Philippines are crying out for help as Nestlé tries to undermine regulations introduced in 2007 to stop misleading promotion. If Nestlé's 'monster bill' passes through Congress it will spell disaster for babies and their families." 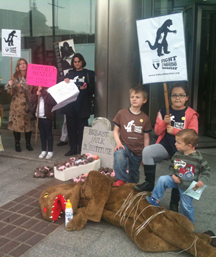 Above: Fighting the Nestlé monster at the annual demonstration at Nestlé (UK) HQ in May 2012. "The draft House Bill... aims to support multinational companies while damaging the Filipino society: families, the mothers and children." Thousands of people have signed a petition of solidarity with the Philippines, boycott supporters have invited thousands of their friends to participate in Nestlé-Free Week on Facebook and people have been emailing Nestlé calling it to respect the International Code of Marketing of Breastmilk Substitutes and subsequent, relevant Resolutions of the World Health Assembly. "This is the nerve centre of the company's Digital Acceleration Team. By monitoring conversation about its products on social media - right down to "realtime recipe tweets" across the United States - they aim to win over a sometimes hostile world." While Nestlé claims to disclose when people commenting online are working for the company, it has not been adverse to dirty tricks. Campaigners in Switzerland involved with the ATTAC group took the company to court after finding their group had been infiltrated by spies reporting to a former MI6 officer working for Nestlé. Disclosure of documents during the court case earlier in January 2012 scared one Brazilian water campaigner when he found the extent of the intelligence gathered about him, as he explained to Swiss WRS radio - click here. According to the statements from Nestlé and the Fairtrade Foundation a total of 7,000 farmers will provide cocoa for KitKat under Fairtrade terms, up from the 6,000 announced in 2009 when only the 4-finger KitKat had the Fairtrade mark (though, curiously, the latest statements claim the initial number of farmers was 2,500). Baby Milk Action contacted the Fairtrade Foundation prior to first issuing the press release and has since been told that the dates of International Nestlé-Free Week were not discussed at its meetings with Nestlé. It says the timing of the announcement was intended for earlier in October when the certification process was completed and suggests the delay until just before Nestlé-Free Week was partly due to its own considerations. What Nestlé's considerations may have been was not mentioned. The 9,600 tonnes of cocoa Nestlé says it will buy through the Fairtrade scheme amounts to 2.6% of its annual cocoa purchase (about 364,000 tonnes). It has been criticised for failing to deliver on its 2001 commitment to end child slavery and child labour in the supply chain as a whole within five years. As in other cases, Nestlé gives a commitment to resolve issues at some future date to divert criticism. For further information, contact Mike Brady on 07986 736179. Membership is a great way to support our work. Members receive our newsletter, vote for our board of directors and issues at our Annual General Meeting and have access to restricted areas of this site.